This is tight monetary policy??? I'm too busy to write much of anything at the moment, but I'm aghast at the "analysis" and proposed remedies being peddled amidst the worsening credit debacle. The left has, of course, seized the day, and blames the free market. Bush has joined in with his plan to make the Fed into GosFinBank, central planner of finance overseeing the economy. I exaggerate only a little. Unfortunately quite a number of alleged defenders of the free market have been making even less sense, and vigorously defending...um... the Fed? Good grief! This defense of the Fed by the usually sensible David Henderson and Jeffrey Hummel is one of the less egregious examples, and it's bad. I posted a rebuttal on Tom Palmer's blog. This is the year-to-year changes in MZM. Where's the tight monetary policy? Tight policy? Where? When? Not when Greenspan was saying that the housing bubble was no reason for tighter policy. It's not there. There is a shrinking of the growth rate that occurs moving towards about 2006, and then when it looked like the housing bubble might pop and the Fed began rate-cutting again, growth picked up as well. Over the seven years of the Bush presidency, MZM grew 72% by my calculation. The seven year period prior to that it was 68%, and the seven years before that it was 47%. (My calculations using Fed data.) So where's the tight policy? There isn't any! The financial debacle was created by the Fed, and by the proclivity of the Congress & President for spending beyond our means. By itself, this deficit spending would simply have driven up interest rates and crowded out private investment. 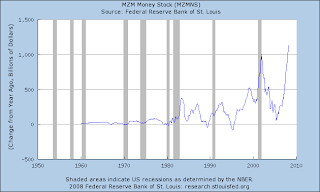 By monkeying around with interest rates and the money supply, the Fed has added misinvestment and the destruction of capital into the mix. 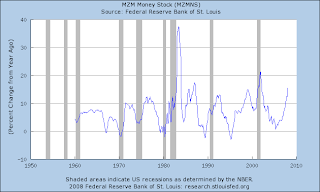 And since a recession to clear the malinvestments is apparently unthinkable, the Fed is now embarked on a program of accelerating inflation and socializing the losses of big investors (i.e. forcing the taxpayers to take them on), the dollar and the citizen be damned. It's horrifying, then, to hear self-proclaimed market economists talk about how the Fed has "learned to do monetary policy right," when actually the Fed is taking us to hell. I should close on a more positive note for change. Robert Murphy (a fellow NYU Austrian Ph.D.!) does a very nice job of rebutting one of the Fed-defenders in the January Freeman, and with colleague Lee Hoskins has a nice comment on the Fed in the 16 March Forbes. Both are worth reading. Krugman on Bernanke: They're both wrong! and Unforeseen Contingencies can explain why! A good friend of mine asked what I think of the comment by Paul Krugman in today’s New York Times. Krugman is commenting on the Fed’s (allegedly temporary) taking on of mortgage debt. I think Krugman is completely wrong, but wrong in a way where he'll still be able to say "see, I told you," almost no matter what happens. The Fed isn't buying risk. It is buying losses. The serious research shows home prices are going to fall further, and the banks know it and the Fed knows it. "privatize the profits, socialize the losses." Krugman doesn’t mention the moral hazard effects of the bailout. Responsible financiers who were conservative and hence took less profit suffered in the boom, and the risk takers took profits. Now that the Fed bails out the risk-takers, any financial incentive to be responsible is eliminated - at least if you’re "too big to fail." 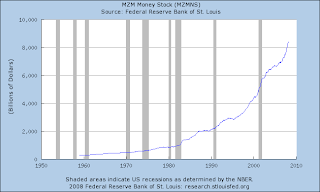 Krugman doesn't mention the effect of the Fed's continual expanding of the money supply: the dollar continues to become less valuable, i.e. domestic price inflation and further collapse on forex markets. That is, and please excuse the strong language, the dollar is being sent to hell. Ken Rogoff (former IMF chief economist) has just pointed out that inflation is growing in the U.S. and around the world precisely because central bankers, and *especially Bernanke*, have stopped making low inflation the priority. I have been wondering why the Fed seems to have given up on fighting inflation. I can't account for Greenspan (probably some explanation involving short range political expediency), but Bernanke seems to have said in a ceremony honoring Friedman something like "Milton, you were right about the Great Depression: we've learned this, and we'll never let it happen again." 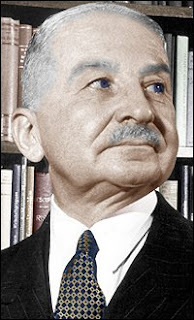 He was referring to the Friedman-Schwartz research that showed that the Fed triggered the 1929 and 1938 collapses by restricting the money supply. So he'll NEVER restrict the money supply, because every problem is a potential Great Depression? I think that's it. He's an inflationist. He has the "core inflation" hokum on his side in pitching this nonsense. Supposedly gas and food prices have more volatility, and hence in a time when they are bouncing around for reasons unrelated to inflation it might make sense to exclude them. But this isn't the case here. For most people food and gasoline are necessities (hard to believe it's necessary to point this out, but apparently this is omitted from Bernanke's blackboard models). Inflation is worsening, and consumers are bearing the brunt. Back to Krugman, he doesn't explain why increasing the money supply can "work magic." It's only in a limited circumstance in which there's substantial unemployed resources and a liquidity dearth...Bernanke's view of every situtation, I guess. Krugman seems to have stopped explaining economics and only is interested in promoting politics - unfortunate, because explaining econ is the only thing he's good at. In sum, I think we'll see continued Fed bailouts of the banking sector, money expansion and inflation, increasing federal deficits, credit market malfunctions, recession, and... the destruction of the dollar. The current Fed policy ought to be criminal, and the Fed ought to be eliminated and replaced with a free market monetary system. But power and wealth of the beneficiaries, I don't expect to see that happen soon. Instead - more of this planned chaos. Ugh. It's a great tragedy: war in Gaza again. Civilians in Gaza are trapped in what amounts to a hellish existence, with war on top of that. I took a little internet tour of photos - lots of heartrending photos - bloodied, screaming children, people crying over lost family members, and the like. Mostly Palestinians, but Israelis as well. ("Nice" shots of an Israeli kindergarten that was hit by a Kassam rocket, I believe it had been evacuated.) It's awful. Art. 7: The Islamic resistance movement extends over the entire globe, it applies everywhere, and Jews are to be killed. Art. 11: Every last bit of Palestine is Islamic, a non-negotiable point. Art. 13: No peace negotiations, no compromises, ever. Jihad only. There's not much to be said, other than that I hope the Israelis exterminate Hamas. How can war be anything but inevitable? The despicable Secretary General of the U.N., Ban Ki-moon, has condemned Israel for using disproportionate force. The $%#&^ of BBC keep suggesting Israeli fears are overblown, because too few Israelis have been killed. Ban, BBC, and the rest are taking a profoundly immoral position. Secretary Ban has admitted Israel is acting in self-defense. If it's self-defense, then force should be disproportionate, overwhelming. It's not as though Hamas acts with restraint. Hamas is poorly armed (but I wonder what they brought through the wall from Egypt), and not very effective, but they give it all they've got. After all, "kill, kill, kill." It is the much better armed and more competent Israelis who hold back. There's little doubt they could annihilate Gaza, were "genocide" really their objective. Both Abbas and Hamas' Mashaal have said this is the Holocaust. It's obviously not, but richly ironic, especially coming from the leader of a genocidal sociopathic totalitarian movement that hates the Rotary clubs to boot. But all in all, just more tragic news. (Israeli flag courtesy of 4 International Flags). 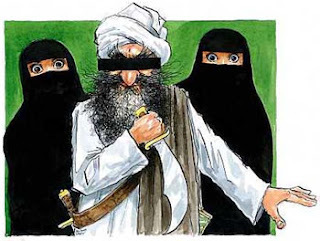 Mohammed cartoon from Jyllands-Posten.